I was lucky enough to come across the Adventures of Clarke Carter some time ago when he dragged wheeled kayaks across a frozen Victoria Island and skied from the North Pole to Canada. He then sailed the Southern Ocean, paddled the Sepik River of Papua New Guinea in a dugout canoe and attempted to row across Bass Strait from the Australian Mainland to Tasmania. Not bad for a guy still in his twenties and now as well as his job as a film maker he has published an e-book on adventure with the aim of encouraging others to share his love of the outdoors. You can download the free e-book and follow his blog here. For all you kayaking fans out there he has a short section on sea kayak adventure on page 44 and hopefully this will inspire your own trips. The epic adventure of crossing Bass Strait from the Australian mainland to Tasmania is covered on page 24 and the photos on the page were taken by me on my 3 Bass Strait Kayak Expeditions, so that at least puts me ahead of Clarke in one adventure count !. 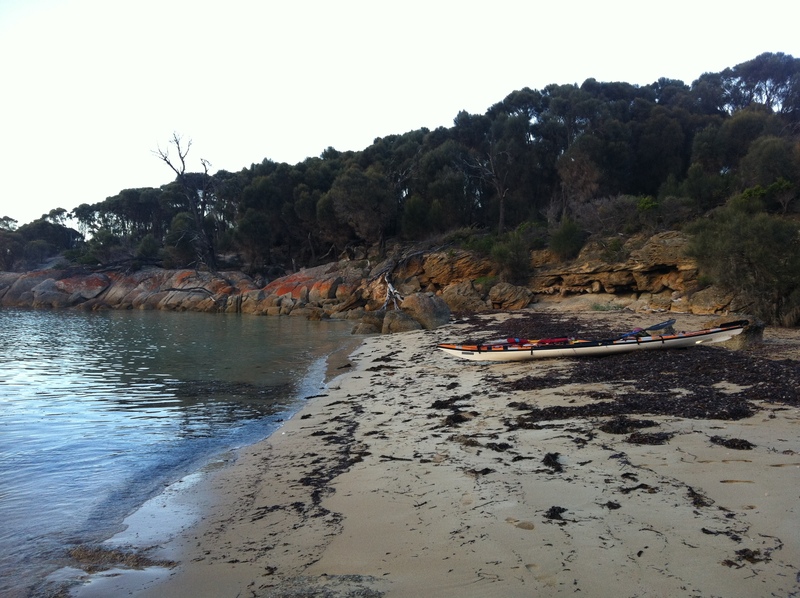 Mal landed today at Little Musselroe Bay Tasmania after crossing Bass Strait in a single Nimbus Telkwa kayak and he did it solo. He had fun with the changing weather, fought with pesky animals (rattus rattus – aka black rat ) trying to steal his food, got dumped in large seas smashing his compass and damaging the kayak, saw lots of aquatic and bird life and camped at places few people will ever visit. All that in just 13 days. Congratulations from everyone at Paddling South. It took 13 days to paddle there, but longer to get back. Mal cant get back on the Spirit of Tasmania Ferry until early April. His report on landing today. Hi All, well that’s it; the big crossing is done. Arrived on Tasmania’s shore today around 4.30pm(EST), to be greeted by my wife Annie, Mal Hamilton & his daughter Donna. The crossing of Banks Strait from Rebecca Cove on Clarke Island to Little Mussleroe Bay on Tassie, went well with the strong currents and 4mtr swell muddled in with a 2mtr constant wind wave and 20knots of wind, just to keep me on my toes. My little make shift compass spent most of the day pointing in the wrong direction as it has done since having my good Silva compass smashed at the beginning of the expedition. I shall be writing a very stern letter of complaint to Garmin since my good GPS the Garmin 78sc decided to die completely as I was about a mile out to sea on the start of the long ocean crossings many days ago. No compass and a stuffed GPS makes for a lot of guess work. I did carry my spare Garmin 78s which constantly shuts down. Oh what fun!!! Many thanks to all that have given me help and assistance along the way. I will create a list and add it to this web posting when I get settled back to civilization. Today Bass Strait tomorrow the world!!!! We were marooned on Deal Island for eight days waiting for the weather to moderate. The winds stayed at around 60 kn for most of that time with huge seas battering the island group. We did wallaby musters, helped other blow-ins and had many other adventures in those eight days and many more on that 19 day crossing of Bass Strait, but maybe I’ll write them down later. Taken from his log and in reverse order. Scroll down for the start. Hi All, well that’s it; the big crossing is done. Arrived on Tasmania’s shore today around 4.30pm(EST), to be greeted by my wife Annie, Mal Hamilton & his daughter Donna. 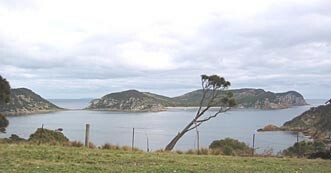 The crossing of Banks Strait from Rebecca Cove on Clarke Island to Little Mussleroe Bay on Tassie, went well with the strong currents and 4mtr swell muddled in with a 2mtr constant wind wave and 20knots of wind, just to keep me on my toes. My little make shift compass spent most of the day pointing in the wrong direction as it has done since having my good Silva compass smashed at the beginning of the expedition. I shall be writing a very stern letter of complaint to Garmin since my good GPS the Garmin 78sc decided to die completely as I was about a mile out to sea on the start of the long ocean crossings many days ago. No compass and a stuffed GPS makes for a lot of guess work. I did carry my spare Garmin 78s which constantly shuts down. Oh what fun!!! Many thanks to all that have given me help and assistance along the way. I will create a list and add it to this web posting when I get settled back to civilization. Today Bass Strait tomorrow the world!!!! 20/3/12 8.33am He’s on the last leg – one more open sea crosssing to go. Today I’m leaving for the last paddle of the expedition. The infamous Banks Strait. This area is known for rough waters and a 3 Knot current. Today seas are moderate around the 2mtr mark and there is a 20Knot NNE’ly wind blowing. Which for a change is not coming direct at me. Spent the night at the beautiful Rebecca Cove and a zillion mossies, but thankfully no Rats!!!. This area is strewn with fantastic offshore “rock gardens”, you could spend days here just playing in and around the rocks with your kayak. Next landing hopefully Little Musselroe Bay on the NE corner of Tasmania. 19/3/12 Mal left for Preservation Island at dawn this morning. He will then try to cross to Tasmania Tuesday early morning. This will be his only chance to catch a weather window and suitable tides to cross Banks Strait which can be a very nasty crossing. Miss this chance and wait a week for weather to pass on a small windswept island !!!! 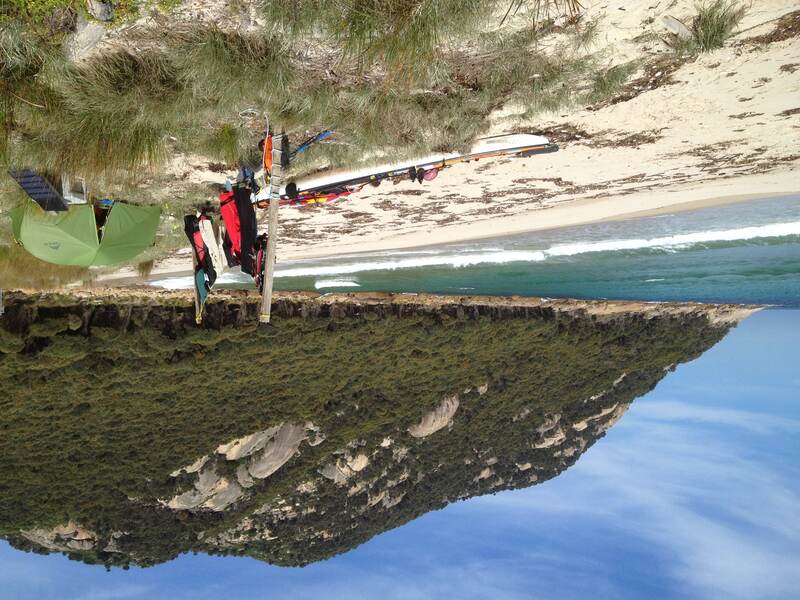 17/3/12 Camped at Settlement Point. 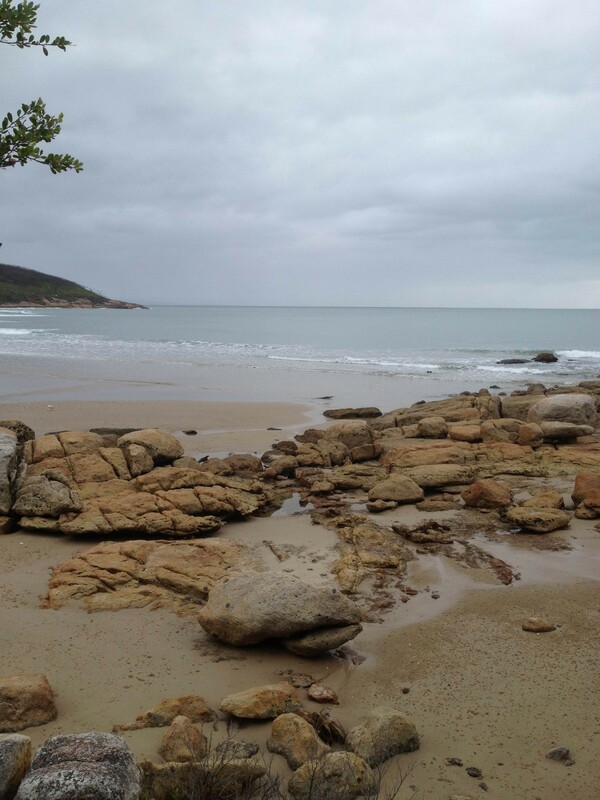 Mal has moved down the coast of Flinders Island to Settlement Point. A beautiful beach and campsite. Phone reception is not good but expect an update in the next day or two.. His location is -40.00241 , 147.88867. Yep, he’s in the Roaring 40’s, that latitude that has bought many a savage storm and many an adventurer unstuck. 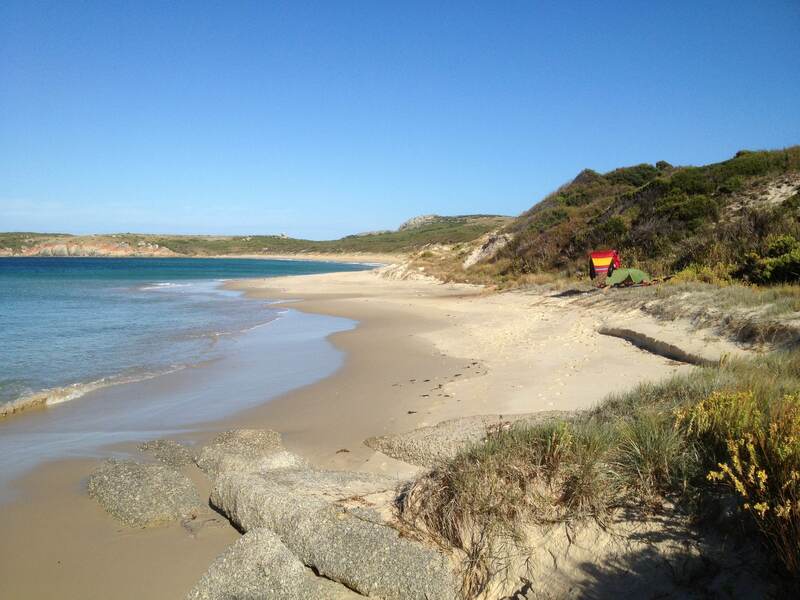 16/3/12 Mal is on Flinders Island. Sheltering from bad weather in the area and hopes to move south along the island over the next couple of days. 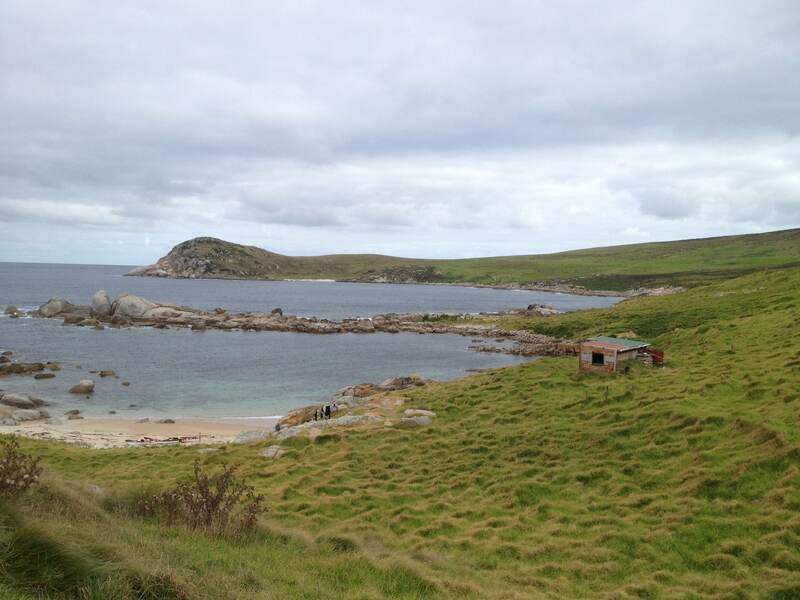 15/3/12 Mal reports in from Flinders Island. Landed at Killiecrankie at 6pm last night (Wed 14th March) which is a small settlement on the Northern tip of Flinders Island. 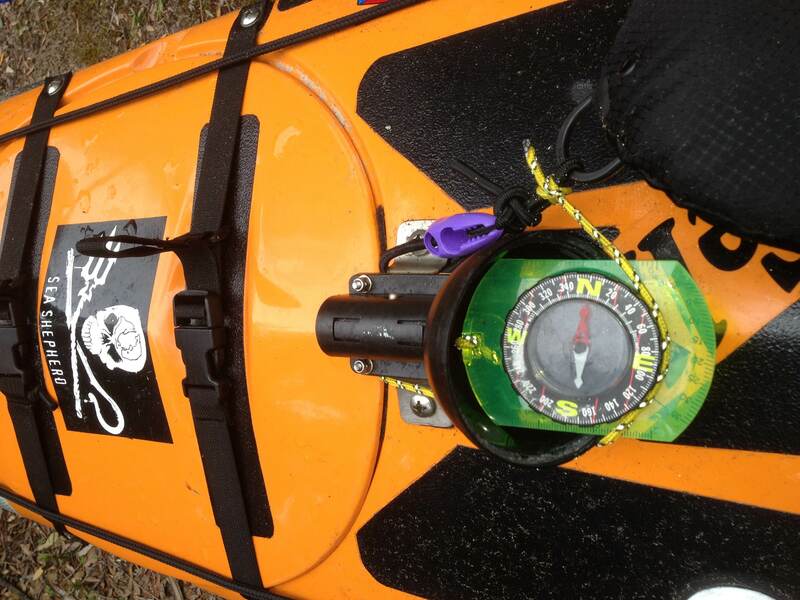 The days paddle was around 70kms and around 11.5 hrs paddling and it just dragged on. The famous words of Bart & Lisa Simpson “Are we there yet” kept coming into mind. The sea state was quite good for the first 10kms with the usual 3 Mtr swells looming at you as a big powerful wall of water. The rest of the trip was made up of coping with the strong currents and constant head winds which just added to the drag. Saw many Penguins swimming as I paddled up and down the swells. I was met on the beach by my wife Annie and good friend Mal Hamilton and his daughter Donna who flew out to Flinders Island. came directly at me from about 10mts away I watched as its wings start to flutter then these two big webbed feet dropped down from the undercarriage as air breaks as it was ready to land, the words “bugger off” were screamed out. The thought of a big bird sitting as a hood ornament on the front of my kayak as I went up and down the swells just didn’t seem right. The things you see when the camera is not out. Paddled the next k or two laughing my head off. Mal B reports from the Kent Group of Islands a cluster of three islands, Erith, Dover & Deal. Day off the water for a change. Spent the day washing, drying, ironing (nah not quite) at my campsite on Winter Cove on the Eastern Side of Deal island. Lovely spot to paddle too one day if your keen!!! 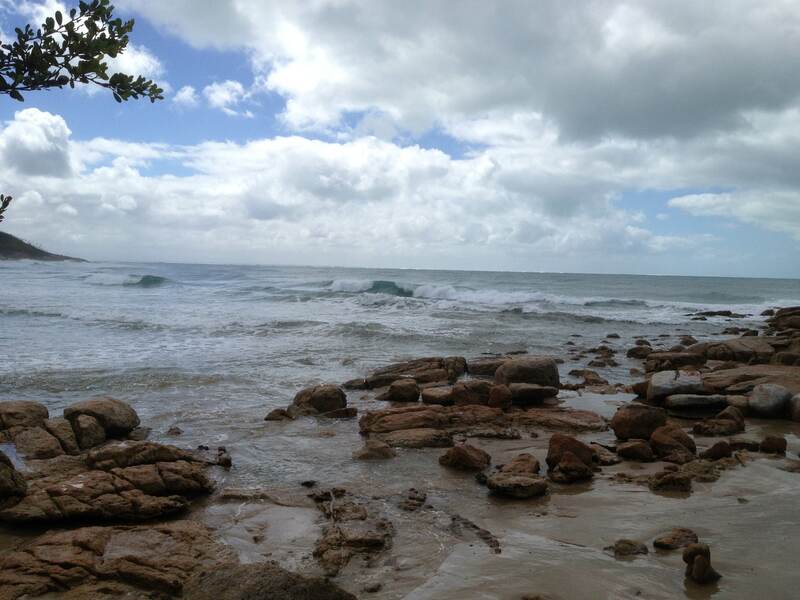 Yesterday I had reasonable good sea state, the swell was still up and did I mention the strong currents. We have just come out of a full moon cycle which intensifies the currents. My intended path yesterday went to pieces within about 10kms of Dover island. The plan was to reach the Southern tip of Dover and enter the notorious Murray Passage renowned for it’s strong currents. I got swept further South than intended and had to fight the current to get back. My plan rapidly changed about 1km from Dover where the current speed by my GPS of 6 Kms/hr or 3.2 Knots was nearly matching my paddling speed. Extra grunt got me to the cliff line where the current speed reduces. The best option was to now follow the Islands West side and aim for the shallow gap between Erith and Dover Islands. By the time I got to gap the tide was now at high tide and slack. I then popped into West Cove and East Cove for a look and photographs then used the Ebbing tide to help get me around to Winter Cove. Last night I was visited by a rather large beedy eyed Possum who nearly came into the tent. 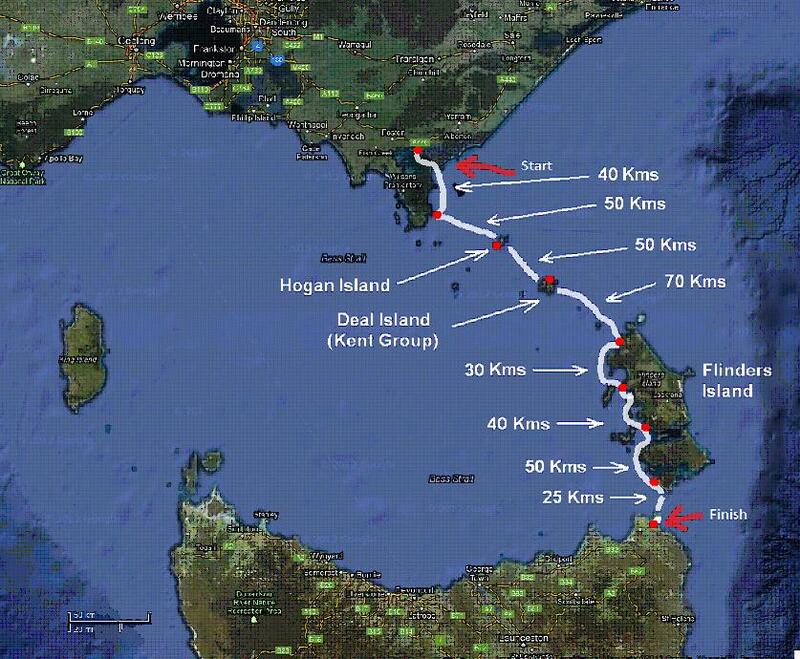 Tomorrow off to Flinders Island which is the longest open water crossing of the trip considering the current drift off track it will be around 70kms. To all that have left messages thank you heaps, I will reply when can. Phone reception at the moment is unreliable. Mals early morning report from Hogan Island. Good night on Hogan island, kept awake by penguins chirping and rats running around. Setup tent on the foreshore and walked away to sit on the rocks nearby to cook tea. Classic beef curry dehydrated yum! 11/3/12 5.23am Message recd from Mal. Leaving Refuge Cove – heading into Bass Strait today. 10/3/12 8.50am. Repair work done. 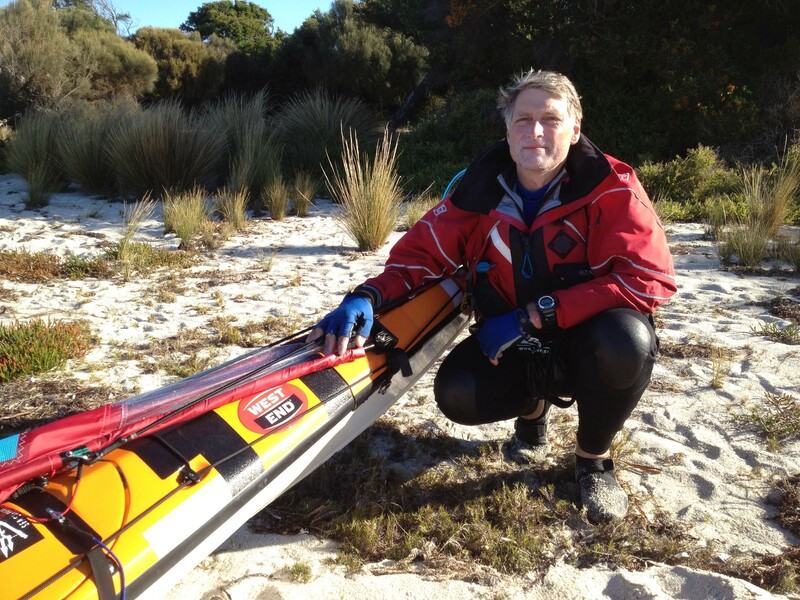 Mal has repaired the kayak overnight and will be pushing on to Refuge Cove this afternoon. There he just waits for good weather before pushing off into Bass Strait and then Tasmania. Photos show how quick the weather calmed this morning. 3.45pm Mal has arrived safely at Refuge Cove. 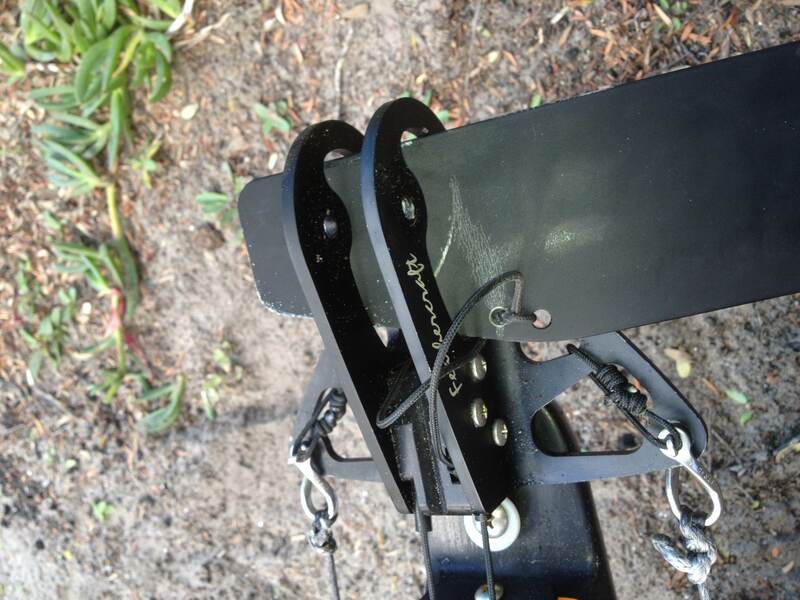 Small bushwalking compass installed on the base of old one. 9/3/12 3.50pm Things not so good. Things are not good. Slammed by 4m-5m waves. Dumped by a 4m + wave around lighthouse point. Rolled back up again to be slammed by a few more. Compass smashed, rudder bent, shoulder hurt and I’m not so good, but made it to shore. Apart from that every thing is dandy. Thanks for all the best wishes from everyone, and remaining positive . Wish you were all here !!!! 9/3/12. Mal is on the move down the coast, but the weather is still bad. -38.89127,146.48186 into Google Earth you can check out his location…. 8/3/12 Mal is still waiting for weather window. Very windy at present and wont paddle today. To keep you informed of his progress I will update this page every time that he paddles. So check in when you can and share his adventure. Mal said—-Mid to late next week (if the weather decides to behave it’s self) I am going to be on the water at Port Welshpool, Victoria and leaving for the Bass Strait sea kayak crossing. The journey is a solo unsponsored / unsupported expedition and will cover around 350 kilometres and “should” take around 9 days or so. The weather at the moment down there is not favourable so some delays are to be expected. To visit the latest adventures from Ben and Lach follow this link. Finally made back to vic. It’s been a great trip, 3 and a half months on the water. About two thirds of that spent sitting out some of the worst weather Tassie could throw at us. Highest recorded wind was 155km/hr, largest waves in excess of 10 metres. Good days to be bunkered down in our tents. Beautiful scenery the whole way and thanks Tasmania for having us. 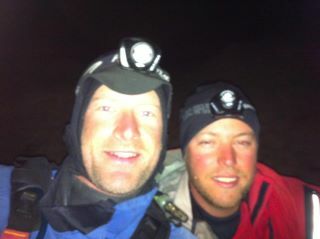 19/3/12 The boys have reached the halfway point in their journey. Follow their link to the latest photo. Hi, we are ok & are remaining in this location. Our next check in ok message will indicate our intent to continue. 26/2/12 Had a great time lazin about in Strahan, time to get the show on the water again. We’re off to the heads at Hells Gate today and will wait for a weather window to run down the coast to Hibbs Point. From there it’s all go to Hobart with a stop in Bathurst harbour for a little upriver sojourn. There are plenty of safe landing sites along the coast if you look carefully enough and take heed of wind and swell direction. Check out the points on our map of the route for more details. We could be in Hobart in 10 days ish if the weather is good, or three weeks if it all goes to pot. We’re both really looking foreward to the next leg and the remoteness the southwest brings. We won’t have any reception from the heads in Strahan to Southport near Cockle Creek so there won’t be much contact other than the regular Spot updates each night. So follow our progress and well post the photos and details of the journey when we’re back in mobile range again. Lifes short, kayak naked! ‎16/1/12. 2 hours sleep, 15 hours paddling ahead… King Is here we come. Nothin like a night paddle in BS to kick things off with a bang! ‎100ks, 17.5 hours, off the couch… training’s just fit people showing off!!! I told you paddling a kayak across Bass strait may not be easy !!! 9/3/12 3.50pm Things not so good. Things are not good. Slammed by 4m-5m waves. Dumped by a 4m + wave around lighthouse point. Rolled back up again to be slammed by a few more. Compass smashed, rudder bent, shoulder hurt and I’m not so good, but made it to shore. Trying to fix damage and work out navigation with compass missing-completely torn off !!!. Apart from that every thing is just dandy. Thanks for all the best wishes from everyone, am remaining positive . Wish you were all here !!!! P.S. 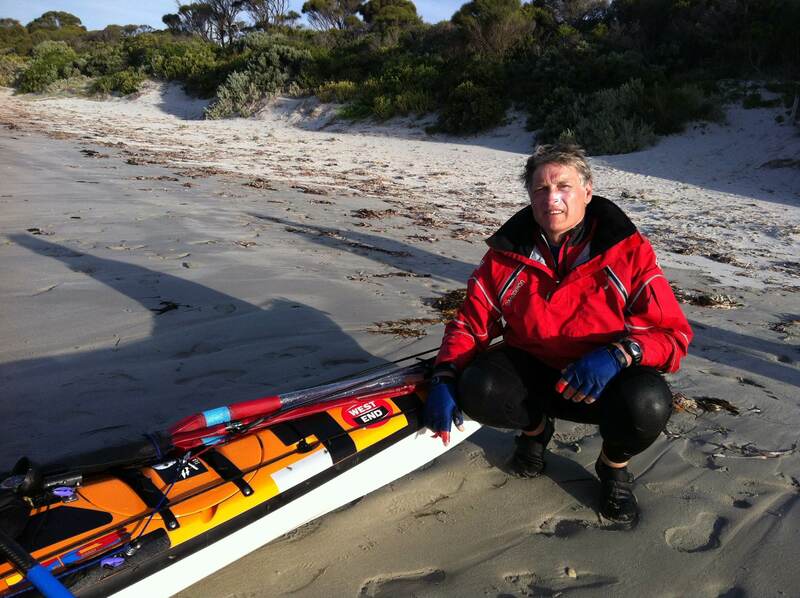 11/3/12 Repairs all done, body all ok, paddling into Bass Strait this morning. 11/3/12 Landed on Hogan Island.